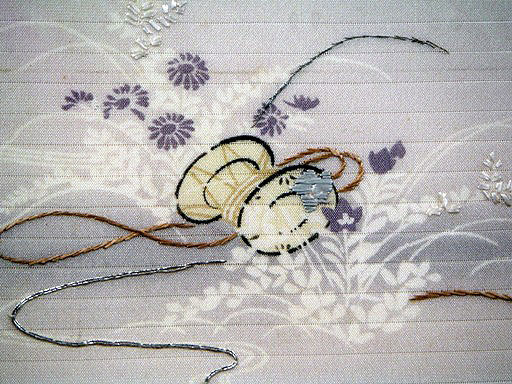 This is a very old, handwoven and rare transparent Silk Gossamer fragment from a woman’s Kimono. It has been hand woven, hand dyed using natural dyes, and hand embroidered including the use of pure White Gold threads for high lights. In Japan’s past, the rules for dress were every bit as rigid as those for other aspects of society. 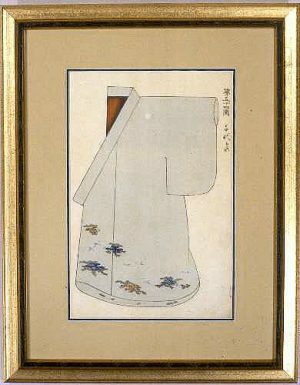 In the Edo and Meiji Eras, women were not allowed to wear the gauze silks except in 3 summer months. This exceptional textile fragment is “Ro” Silk, and thus, this textile treasure was intended only to be worn in June, July, and/or August. This design was obviously intended for summer, and meant to give a cool feeling at the hottest time of the year. 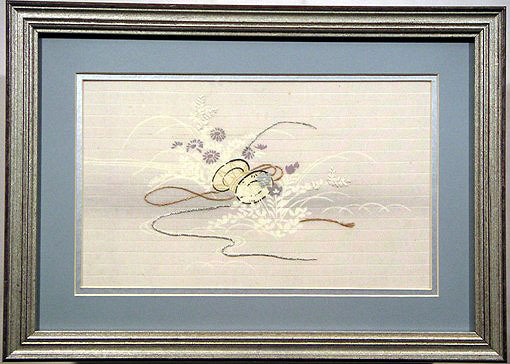 This particular motif gives a light and airy feeling through its use of color, its depiction of cool grasses such as Clover (“Hagi”) and Chrysanthemums (“Kiku”) blowing in the breeze and heralding the coming of Fall. The inclusion of the “Kakko” or double skin barrel shaped drum is very unusual. The Kakko was used in performing “Gagaku,” an elegant form of court music, and was used by the leader of the musical ensemble. 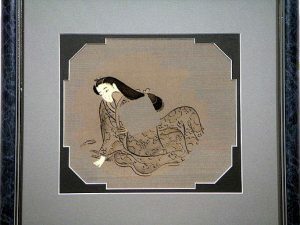 It’s occurrence here was to reinforce the literary and musical heights to which the noble lady who wore this Kimono aspired, as the hand drum has long been a classical musical instrument. 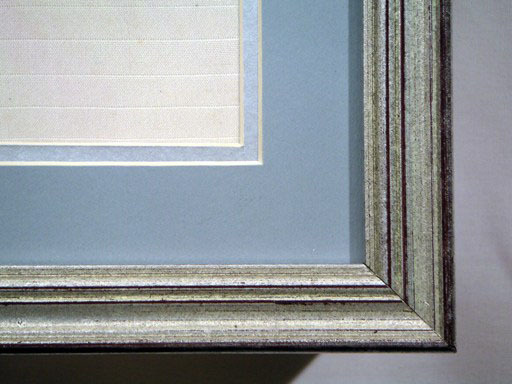 The freshness of this motif created the illusion of shading which was accomplished through variations in the widths of the hand dyed background as well as in the Ro Silk weave, which incorporates very fine lines of denser with very sheer rows of weaving. Only a young woman of nobility and great wealth could have worn a garment of this quality for only 3 months of the year. 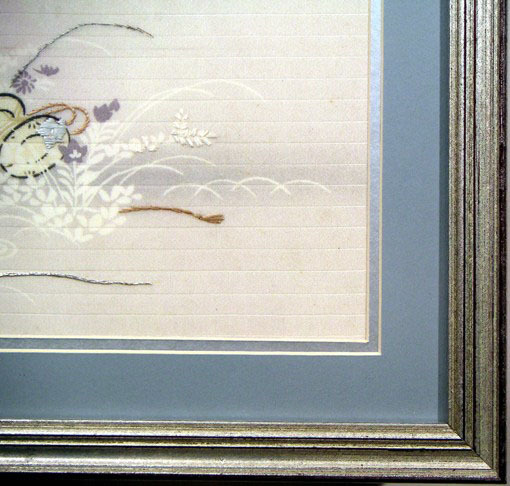 This exceptional Kimono is "Ro" silk. 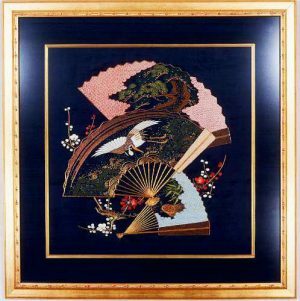 The elegant silk gossamers of Japan are members of the gauze family and are all known in Japan as "Karami ore," a loose open mesh weave. The secrets of these open weave fabrics is the twisting of their fine warp threads in pairs. The weft threads are inserted between the twists, forming an open weave that is strong, beautiful, and cool. These Silks became famous through their use on the Noh Stage and glistening over the robes of Buddhist monks, or simply worn by the most wealthy as kimono. Exquisite and in excellent condition.